This kind of binding was designed by Ricketts during the late 1890s and early 1900s especially for Vale Press books (and some Kelmscott books as well) at the request of contemporary collectors. One may remember the series of bindings he designed for Laurence Hodson (see blogs no. 96, 111, 112, and others). This copy of The Poems of John Keats (1898) is bound in full crimson leather (probably sheepskin), and stamped in gilt with a design of panels, lines, dots, circles, hearts, and leaves. The bindings bear the signature 'HR' on the tail turn-in of the back board. 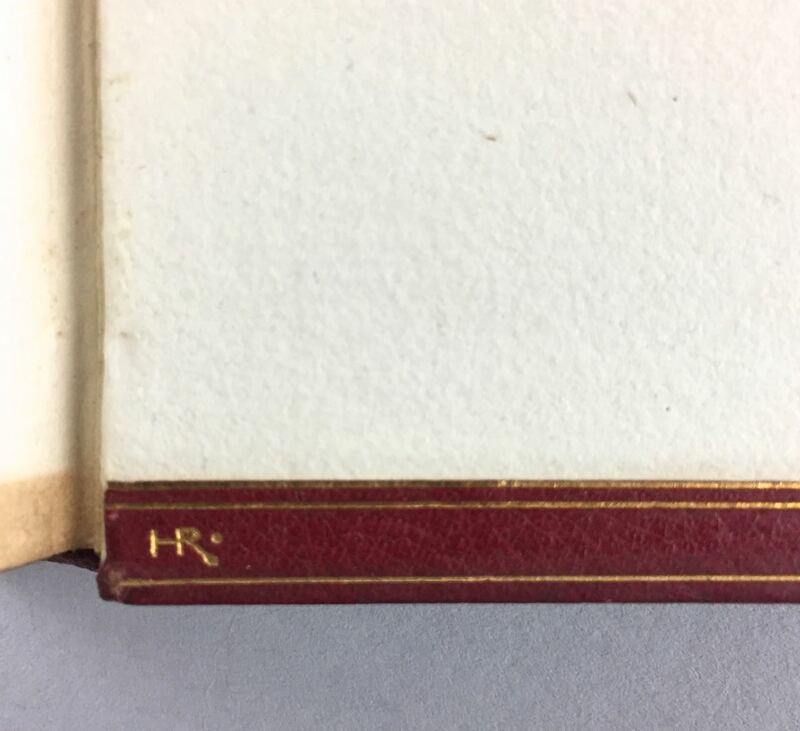 'HR' stands for Hacon & Ricketts, the official name of the publishing venture that we also know as The Vale Press. The books are printed on paper (there was also a small number printed on vellum). 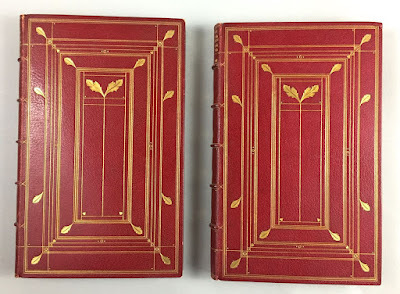 These specially commissioned bindings for Vale Press books were manufactured by bookbinders in London, initially Riviere and Sons, and later Zaehnsdorf. These firms didn't sign the bindings. 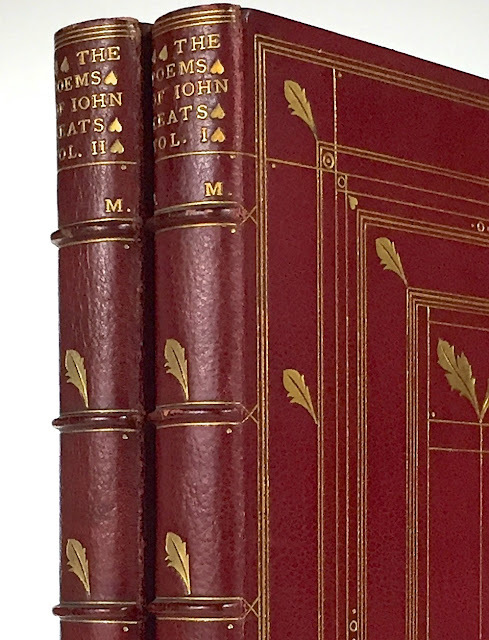 The spine of the Keats set on review has five raised bands, and six panels, of which the first contains the title. These two volumes have an interesting provenance. There are two bookplates. However, it is possible to trace three former owners. 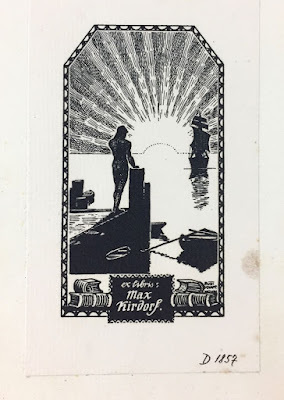 The older bookplate is from a German collector, Max Kirdorf. Max Kirdorf was born in Rothe Erde (near Aachen) on 4 June 1878; he died in Burtscheid on 7 June 1923. He was an iron and steel engineer who married into the Suermondt family that stood at the basis of the Suermondt-Ludwig-Museum in Aachen. His wife was Adele Caroline Luise Suermondt (1882-1958). Part of Kirdorf's collection ended up in the library of the Suermondt-Ludwig-Museum. This concerned his illustrated books and, more importantly, his print collection that included series of etchings by Piranesi and Goya. Kirdorf was co-founder - with Ernst Birkner - of one Germany's first private presses, the Eginhard-Presse located in Aachen. It published books without illustrations along the lines of 'pure typography'. 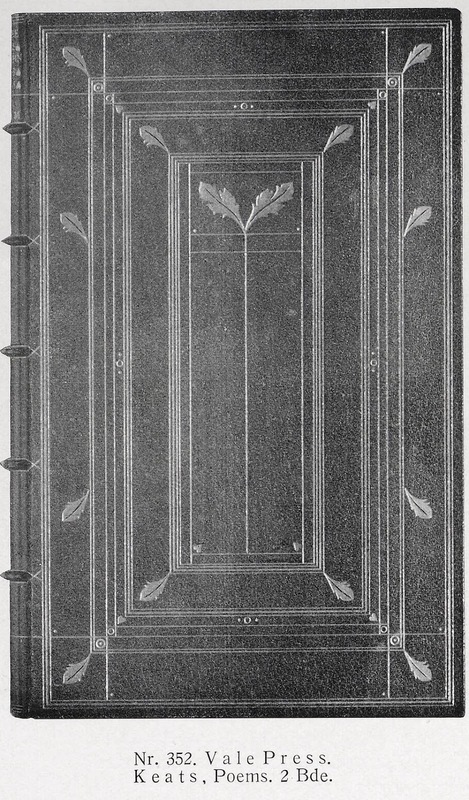 Birkner,a book designer and professor at the applied art school, continued the private press after Kirdorf died in 1923. 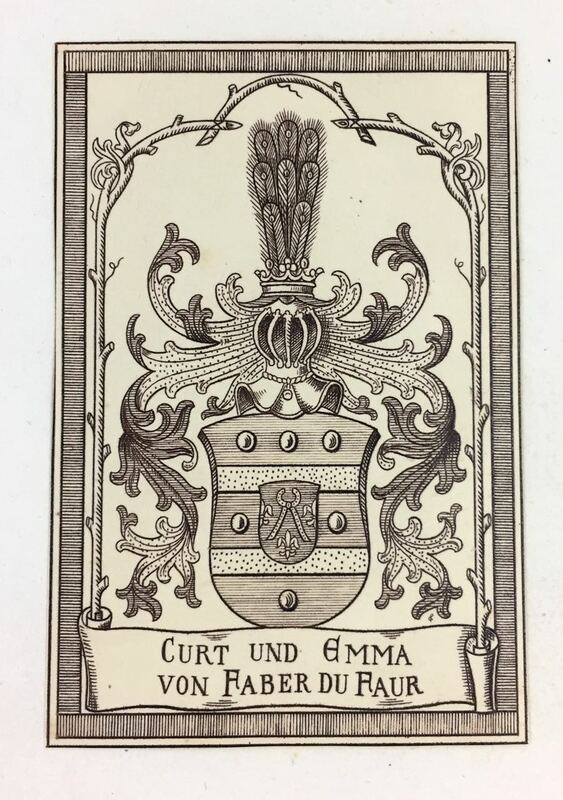 The second bookplate is that of Curt and Emma von Faber du Faur (1890-1966). He was an author, collector, literary historian, curator of the Yale Collection of German Literature, and Yale faculty member. Curt von Faber du Faur came from a distinguished military family in Germany, and was born in Stuttgart on 5 July 1890. He died on 10 January 1966. A lieutenant in the German army from 1909 to 1919, he was discharged because of illness. He studied History of Art and German Literature at Munich and Giessen, and his dissertation on a late fifteenth-century engraver (Der Hausbuchmeister) was published in 1921. In the 1920s he met his future wife Emma Schabert in the circles of the German poet Stefan George. In 1923 he settled in Munich as an antiquarian bookseller with Georg Karl (1892-1975): Karl und Faber, now the firm of Hartung & Hartung. They also organised auctions for manuscripts, graphic art and paintings (from 1927 onwards). In 1931, Faber du Faur moved to Florence to live on a farm with olive trees, growing wheat, and grapes. He wrote some books of poetry, and articles for German newspapers. In 1939, he emigrated to the United States, taking with him his vast collection of German baroque literature, which would form the basis of a groundbreaking bibliography. This collection, begun in 1912, became the property of Yale University in 1944. The bookplate of Curt and Emma von Faber du Faur in the Keats edition testifies of his and his wife's international interests. Curt Faber (that's the name he used ordering a taxi) was an inspiring professor at Yale, versed in Italian, German, French, and English literature. The binding was designed by Ricketts, but not for the owner whose name is on the first bookplate. 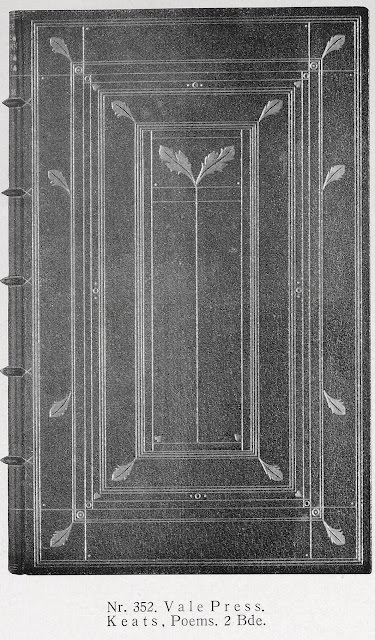 The first owner of the book had several bookplates, but didn't paste one in these volumes (unless, of course, one of the later bookplates was pasted over his). But his monogram is given on the binding. In some cases Ricketts had the initials of the collector placed on the front cover, and in other cases they appeared on the spine. One can see an 'M' below the title of the book on the spine. Going back to the auction catalogue of Max Kirdorf's collection that contained an image of the binding, we can discern the same initial 'M' on the spine in the title panel. JM is John Morgan, whose collection was sold by Sotheby, Wilkinson & Hodge on 25-26 March 1908: Catalogue of the Valuable Library of John Morgan. 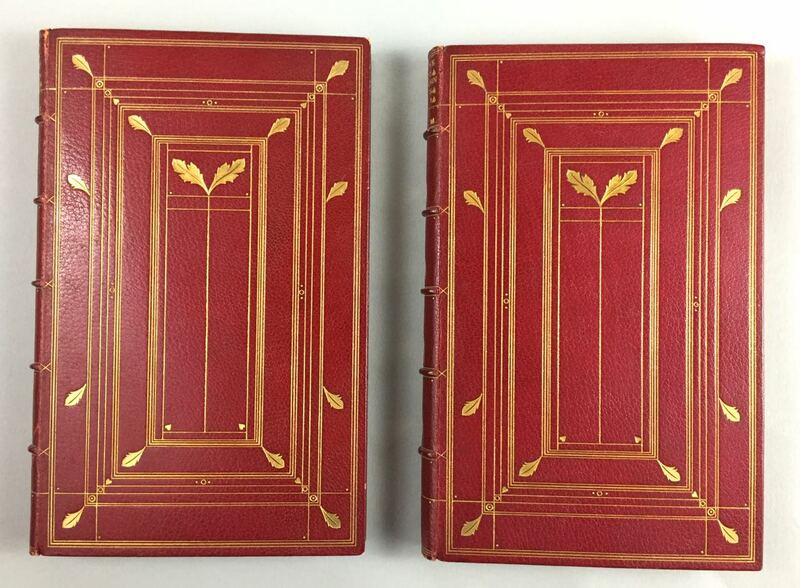 Lot 213 was the Vale Press Keats edition: 'red morocco extra, the sides tooled to a special design of panels and leaves, g.e.'. The book was acquired by antiquarian book dealer Edwards for £2 19s. John Morgan was the first owner. He was born in Kirkhill of Kennethmonth in Scotland on 2 July 1844, and he died in Aberdeen City on 3 July 1907, a year after his wife for 35 years Matilda Murray Morgan had been buried (1847-1906). Their daughter, Mathilda Morgan, outlived them (1880-1955). 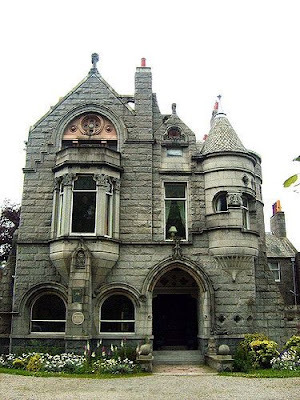 She died in Kincardine O'Neil, where Morgan had built a holiday home in 1890: Torphins, William Street, Woodcote. It was inspired by wooden Canadian bungalows near Toronto and Montreal that Morgan had visited on a trip to North America. Morgan was a great bibliophile, collecting more than 4500 books, including a vast series of rare John Ruskin material. It was said of him that he not only possessed books, 'he also read them' (see Aberdeen, 1800-2000. A New History (2000), p. 386). He also collected bookplates, and asked artists to design one for him. 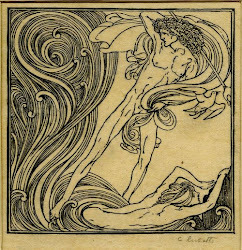 Ricketts designed a bookplate for him in 1899. 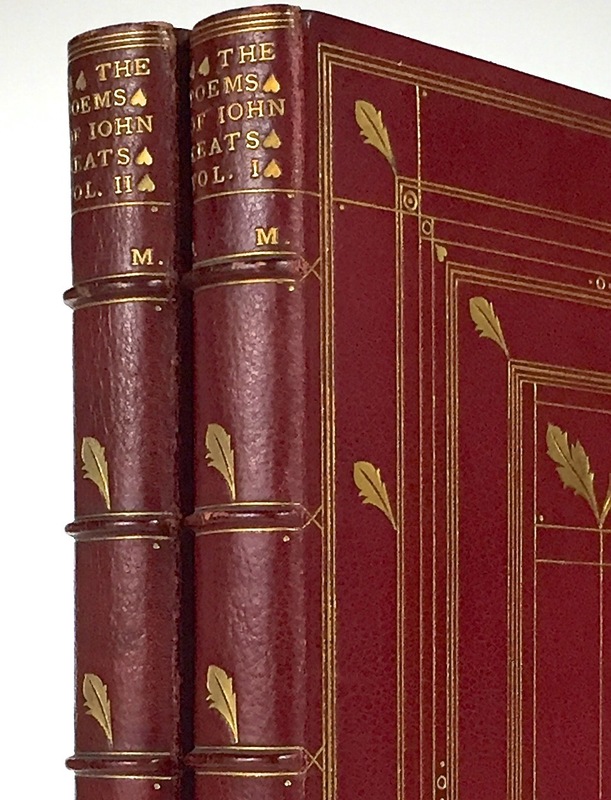 Apparently, the Keats volumes didn't carry his bookplate, but then, his initials were already given on the spine. 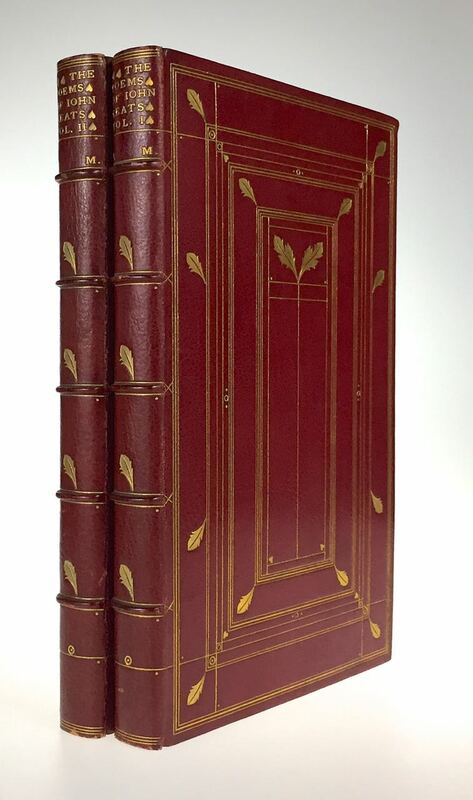 The two volumes of the Vale Press Keats edition were published in London, transported to Aberdeen, sold in London, acquired by a London book dealer, and subsequently included in a German collection, before they emigrated to the USA, where they can be purchased today.